World Dryer, the leading global manufacturer of hand dryers, is the only company of its kind to offer a full portfolio of fast, state-of-the-art hand dryers designed to fit the individual needs of any facility. For more than 60 years, our products have set the industry standard by integrating leading technology, convenient functionality and attractive design to give every user an unparalleled experience. Our high-speed hand dryers are all designed to deliver a faster, more effective drying experience while reducing operational costs.With more than 800 distributors worldwide and over 18-plus certifications representing more than 85 countries around the globe, World Dryer truly is the hand-dryer manufacturer of choice. In this one-hour course, we’ll discuss the evolution of electric hand dryers and how today’s high-speed, energy efficient dryers minimize impacts on the environment while providing a speedy and efficient user experience with lower operation and maintenance costs. 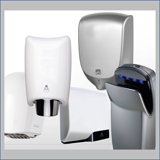 We’ll also explore an array of high-speed hand dryer features including HEPA filter, antimicrobial technology, ADA compliance, maintenance indicator and sound and speed controls to address the unique needs of various application environments. Learners will also gain insight into how specifying high-speed, energy efficient hand dryers contributes to green initiatives. Describe the innovations of hand dryers on the market today and how new technology has improved the hand drying experience. Discuss how dryer speed and heating elements affect drying time, sound level and energy efficiency. Explain design requirements and installation for ADA and wall mounting. Understand the sustainability of hand drying methods regarding hygiene and environmental impacts. Define the benefits of hand drying in terms of cost, payback, and ROI. Describe green building contributions of high-speed hand dryers and which LEED credits they may contribute.